On 29 November 2004, a-ha released a collection of their singles "The Singles 1984|2004" in Norway and Germany and on 22nd December in Sweden. The album was released in the UK on 11 April 2005 under the slightly different title The Definitive Singles Collection 1984|2004. It includes 19 of their singles (not the complete collection) which have been digitally remastered by Dan Hersch and Bill Inglot. The cover features a shot of the band (Paul, Morten and Magne) printed in green tones. The a-ha logo is printed in light blue in the top left corner with the title in light green underneath. There is a blue sticker on the front which reads "20 years of hits digitally remastered". The 6 page booklet features text about the band by Jan Omdahl (author of The Swing Of Things) plus a collage for each band member made up of nine close-up shots of parts of their faces. The booklet includes another five pictures of the band / band members plus the track listing over two sides at the back. The reverse of the booklet has a further shot of the band running outdoors. 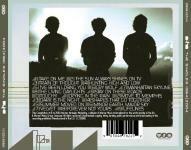 The back cover features a silhouetted shot of the band with the track list printed at the bottom of the picture. The disc is white with the title in grey at the top and an artist impression picture of the band at the bottom. The square around the centre of the disc and other shapes are white. The back sleeve is also printed in green tones and features a silhouetted picture of the band against the sky with the tracklist across the bottom of the picture. Surounding the.picture are some green/grey shapes (triangles and a square) plus some coloured lines. The spine of the CD is greenish grey with white text. The album includes the "edit" version of "Manhattan Skyline" which was previously only available on vinyl. The regular Argentinian CD release comes with the usual front cover artworks but includes a silver "ifpi" hologram sticker. There are subtle differences between the Argentina release and the European edition including slight differences in darker colours used in the insert booklet and a lighter shade of white on the disc. In addition, the last page of the CD booklet has the revised catalogue number 5046-76225-2 printed onto it. The Manufacturing & Copyright information on the back sleeve and around the outer rim of the disc is printed mainly in Spanish; "This Compilation: ℗ & © 2004 Warner Strategic Marketing, a division of Warner Music International for the world outside of the US. A Warner Music Group Company. LC 02982. Publicado y distribuido por Warner Music Argentina S.A. A Warner Music Group Company. Miembro de CAPIF. Reservados todos los derechos del productor, de los outores y de los interpretes de los obras reproducidos en este ejemplar, prohibida la reproduccion, regrabacion, alquiler, prestamo, conje, ejecucion publico, radiodifision y cualquier uso no autorizado de estos fonogramas. SADAIC – BIEM / AADI – CAPIF INDUSTRIA ARGENTINA". The disc comes with the regular layout but without the silver coloured square and triangular shapes printed around the centre ring and on the right hand side. There is also some additional "WARNER MUSIC ARGENTINA" and "COMPACT disc DIGITAL AUDIO" logos printed on the right hand side next to the regular "WARNER STRATEGIC MARKETING" logo and revised Catalogue number 5046-76225-2. The promo Argentinian made CD comes with an additional red promo stamp on the disc which reads "Disco Promocicnal Prohibida Su Venta". The Australian release of "A-ha The Singles 1984|2004" is similar to the EU release but includes some Australian Manufactured & distributed information of the back sleeve; "Artwork © 2004 Warner Strategic Marketing, a division of Warner Music International for the world outside of the US. A Warner Music Group Company. All rights reserved. Unauthorised copying, hiring, lending, public performance and broadcasting of this recording prohibited. Manufactured and distributed by Warner Music Australia. A Warner Music Group Company. www.warnermusic.com.au". The insert booklet is also the same as the EU release except for the catalogue number 5046762252 being printed and displayed differently on the back page. The disc is white with the usual silver text and regular layout, but unlike the EU release, it includes the additional silver square around the centre ring of the disc and silver triangle on the right hand side. The other shapes on the left hand side making up the a-ha logo are also shown in silver rather than white. Around the outer edge of the disc is the same Manufacturing and distributing information which appears on the back sleeve. There is a Bulgarian cassette album release of "The Singles 1984|2004" which comes with similar front cover artworks to the CD release displaying the regular a-ha logo in light blue, with the title; "THE SINGLES 1984|2004" in light green located at the top left hand corner on a greenish grey background to match the spine. The usual album artwork picture is displayed underneath at the lower half of the front sleeve and includes an additional silver "Б.А.М.П." CD hologram sticker. The front cover sleeve folds-out to contain the usual text about the band by Jan Omdahl, plus some of the pictures located on the reverse of the back sleeve which were included inside the CD booklet. The same full 19 track listing is also included and the information is additionally printed inside the fold-out insert to display track credits and each single release date. The greenish grey coloured spine comes with white printed text displaying the title; "a-ha THE SINGLES 1984|2004" in the centre with the Catalogue number 50-50467-6225-4-8 on the left and "WARNER STRATEGIC MARKETING" logo on the right. On the back sleeve which is coloured light blue with black printed text, there is a white barcode in the centre displaying the number "5 50467-6225-4 8" with some Manufacturing information shown underneath which reads; "Manufactured by ORPHEUS MUSIC, A Warner Music International licensee". The track listing for side 1 is displayed down the left hand side, with the track listing for side 2 shown down the right hand side. Along the bottom of the back sleeve is regular Production and Copyright text which appears on the back cover of the CD release; "This Compilation ℗ & © 2004 Warner Strategic Marketing, a division of Warner Music International for the world outside of the US. A Warner Music Group Company. All rights reserved. Unauthorised copying, hiring, lending, public performance and broadcasting of this recording prohibited. Manufactured in the E.U. LC 02982". The actual cassette is clear transparent with a grey centre piece and white printed text. The title; "A-HA/THE SINGLES 1984 – 2004" is displayed along the top with the track listing to each side underneath. On the left hand side, it shows the "WARNER STRATEGIC MARKETING" logo, Catalogue number 50-50467-6225-4-8 and "GEMA/BIEM" symbol. Whilst on the right hand side, its displays side "1" or "2", "120μs" symbol and the "DOLBY STEREO HX-PRO B-NR" logo. Along the bottom of side 1 is the same Manufacturing and Copyright information which appears on the back sleeve, but along the bottom of side 2, the information has instead been omitted, just leaving an empty space. The Brazilian first pressed CD release of "a-ha THE SINGLES 1984|2004" was Manufactured by "Videolar" and distributed by "Warner Music Brasil Ltda", it does not include the usual aqua coloured "20 years of hits digitally remastered" sticker on the front of the CD case. The layout is similar the European release showing the regular front and back cover artworks and comes with the same full track listing printed in white on the back sleeve. The Manufacturing and distributing information has also been changed and is printed in Portuguese to read; "© 2004 Warner Strategic Marketing Internacional, Warner Music Internacional ℗ 2004 Warner Music Brasil Ltda., uma empresa Warner Music Group. Produzido no Polo Industrial de Manaus por Videolar S.A. – Av Solimoes, 505 – Distrito industrial Manaus – AM CNPJ 04.229.761/0004-13 – Industria Brasileira. Distribuido pela Warner Music Brasil Ltda. – CNPJ 42.470.112/0012-09". At the bottom of the back sleeve, it includes the usual white barcode "5 050467 622524", "WWW.A-HA.COM" website address and "WARNER STRATEGIC MARKETING" logo. An additional "www.warnermusic.com.br" Brazilian website address and the "PRODUZIDO NO POLO INDUSTRIAL DE MANAUS CONNECA A AMAZONIA" Flying Bird logo have been added. The disc itself comes in the usual white with the silver printed text and is similar to the European release. There is an additional grey square printed around the clear centre ring and a grey triangle to the right hand side of the disc. There are some other grey shaped patterns to the left, which appear to be making up the word "A-ha". The title "a-ha THE SINGLES 1984|2004" is included as usual at the top, with the hand drawn pictures of the three A-ha band members at the bottom. The "WARNER STRATEGIC MARKETING" logo is located as usual to the right, but unlike the European edition, the Catalogue number has been printed around the outer rim of the disc, rather than under the "WSM" logo. The same Manufacturing and distributing information which appears on the back sleeve has also been included around the outer rim of the disc. The inside of the CD comes with the regular colour European artwork booklet. There is also some additional batch issue coding printed in white around the centre ring of the disc and on the one side of the spines. At least four copies of this album are known to exist; AA0004000, AB0001000, AC0001000 & AE0001000. There is a second "Videolar" Manufactured Brazilian CD release of "a-ha THE SINGLES 1984|2004" which comes with the same layout as the first "Videolar" edition, but includes some different Manufacturing and distributing information which is printed more clearer and printed this time in white bold on the back sleeve; "© 2005 Warner Brasil Ltda. Uma empresa Warner Music Group. Produzido no Polo Industrial de Manaus por Videolar S.A. – Av. Solimoes, 505 – Distrito Industrial – Manaus – AM. CNPJ 04.229.761/0004-13 Industria Brasileira, sob encomenda da Warner Music Brasil Ltda. CNPJ 42.470.112/0012-09. Distribuido pela Warner Music Brasil Ltda. CNPJ 42.470.112/0012-09". The regular white barcode "5 050467 622524", "www.warnermusic.com.br" and "WWW.A-HA.COM" websites are shown, along with the "PRODUZIDO NO POLO INDUSTRIAL DE MANAUS CONNECA A AMAZONIA" Flying Amazon Bird & "WARNER STRATEGIC MARKETING" logos. The inside of the CD comes with the regular European colour booklet and contains the same disc as the first Brazilian Videolar release displaying the original Manufacturing and distributing text; "© 2004 WARNER STRATEGIC MARKETING INTERNATIONAL, WARNER MUSIC INTERNATIONAL ℗ 2004 WARNER MUSIC BRASIL LTDA. TODOS OS DIREITOS RESERVADOS. PROIBIDA A EXECUCAO PUBLICA, RADIOTELEDIFUSAO E LOCACAO. PRODUZIDP POR VIDEOLAR ® INDUSTRIA BRASILEIRA – SOB LICENCA DA WARNER MUSIC BRASIL LTDA CNPJ 42.470.112/0001-56 UMA EMPRESA WARNER MUSIC GROUP. 5050467622524". At least nine copies of this second pressing exist, but again come with a different batch issue coding;- AG001000, AH0001000, AI0001000, AJ0001000, AK0001000, AL0001000, AN0001000, AO0001000 & AP0001000. There was another second "Sonopress" pressing released in Brazil with again the same regular album front cover artworks but showing different Manufacturing & distributing information on the back cover; "© 2004 Warner Music Brasil Ltda. Produzido no Polo Industrial de Manaus e distribuido por Sonopress Rimo Ind. e Com. Fonog S.A. - Ind. Bras - CNPJ67.562.884/0004-91. Sob Licenca de Warner Music Brasil Ltda. - CNPJ42.470.112/0001-56. Todos os direitos reservados. Proibida a reproducao, execucao publica e locacao desautorizadas sob as penas da lei". The usual "PRODUZIDO NO POLO INDUSTRIAL DE MANAUS CONNECA A AMAZONIA"Flying Amazon Bird logo is also on display, but there is no additional "www.warnermusic.com.br" or "www.warnermusicstore.com.br" Website Addresses on this second Pressing. The disc included inside is exactly the same as the earlier "Sonopress" release. At least six copies of this Sonopress second pressing exist, again with different batch issue coding;- BB0000500, BC0000500, BD0000500, BE00500, BF0000500 & BG001000. The "a-ha Singles 1984/2004" CD album was re-released again in Brazilian but was instead Manufactured and distributed by "Rimo Entertainment Industria E Comercio S/A". The album comes with the regular front and back cover artworks and has a similar layout to the earlier "Videolar" editions. The Manufacturing and distributing information on the back sleeve has also been amended to read; "© 2004 Warner Music Brasil Ltda. Produzido No Polo Industrial De Manaus E Distribuido Por Rimo Entertainment Industria E Comercio S/A – Av Guaruba, No 585 – Distrito Industrial l – Cep: 69075-080 – Manaus – Am – Cnpj 67.562.884/0004-91 – Industria Brasileira. Sob Licenca De Warner Music Brasil Ltda. Cnpj 42.470.112/0012-09. Todos Os Direitos Reservados. Proibida A Reproducao, Execucao Publica E Locacao Desautorizadas Sob As Penas Da Lei". The regular white barcode "5 050467 622524" and the "WWW.A-HA.COM" website are shown, along with the "PRODUZIDO NO POLO INDUSTRIAL DE MANAUS CONNECA A AMAZONIA" Flying Amazon Bird & "WARNER STRATEGIC MARKETING" logos, but the usual "www.warnermusic.com.br" website has been omitted. The inside of the album comes with the regular colour artwork booklet and includes the same actual disc as the previous Sonopress releases displaying the same white with silver printed texted layout including the additional lighter grey square around the clear centre ring and lighter grey triangle to the right hand side. The title "a-ha THE SINGLES 1984|2004" is also included as usual at the top, with the hand drawn pictures of the three A-ha band members at the bottom. The "WARNER STRATEGIC MARKETING" logo is located as usual to the right hand side, along with the additional "COMPACT disc DIGITAL AUDIO" and "PRODUZIDO NO POLO INDUSTRIAL DE MANAUS CONNECA A AMAZONIA" Flying Amazon Bird logos. Around the outer edge of the disc is the regular "Sonopress" Manufacturing and distributing information which reads; "© 2004 WARNER STRATEGIC MARKETING INTERNATIONAL, WARNER MUSIC INTERNATIONAL ℗ 2004 WARNER MUSIC BRASIL LTDA. PRODUZIDO NO POLO INDUSTRIAL DE MANAUS E DISTRIBUIDO POR SONOPRESS RIMO IND. E COM FONOG. S.A. – IND. BRAS – CNPJ 67.562.884/0004-91. SOB LICENCA DE WARNER MUSIC BRASIL LTDA – CNPJ 42.470.112/0012-09. TODOS OS DIREITOS RESERVADOS. PROIBIDA A REPRODUCAO, EXECUCAO PUBLICA E LOCACAO DESAUTORIZADAS SOB AS PENAS DA LEI. 5050467622524". Similar to the earlier Brazilian editions, there is some additional batch issue coding printed in white around the centre ring of the disc and on the one side of the spines; BH0000500. The first Chilean release of "A-ha THE SINGLES 1984|2004" was Manufactured by "Warner Music Chile S.A." and comes with a round blue and white sticker on the front cover displaying; "ENVIA LA PALABRA WARNER AL 7276 Y DESCARGA TU MUSICA FAVORITA", when translated it reads; "SEND THE WORD WARNER TO 7276 AND DOWNLOAD YOUR FAVORITE MUSIC". A silver "ifpi" hologram sticker is also included alongside. On the back sleeve, the printed Manufacturing & Copyright information is mainly in English; "This Compilation ℗ & © 2004 Warner Strategic Marketing, a division of Warner Music International for the World outside of the US. A Warner Music Group Company. ℗ 2005 Warner Music Chile S.A. All rights reserved. Unauthorised copying, Hiring, lending, public performance and broadcasting of this recording prohibited. LEY 17.336. Hecho en Chile". The regular "WWW.A-HA.COM" website and white barcode displaying the same number as the European edition is shown, along with the usual "WARNER STRATEGIC MARKETING" and additional "WARNER MUSIC CHILE" logos. The inside of the album contains the same colour booklet as the European release, with the regular layout to the disc, white with silver text and displaying the square and triangular shapes. The title "a-ha THE SINGLES 1984|2004" is displayed along the top and includes the made up A-ha logo on the left-hand side. Around the outer rim of the disc is the same production and copyright information, which is included on the back sleeve. The Catalogue number is also the same as the European edition 5050467-6225-2-4. The second pressing was released instead by "MUSIC & MARKETING CHILE S.A. under license to WARNER MUSIC CHILE S.A.", it also includes the silver "ifpi" hologram sticker on the front cover, but the Manufacturing and Copyright information on the back sleeve is different and is now printed mainly in Spanish to read; "℗ Y © 2004 INDUSTRIAS DE RADIO Y TELEVISION S.A. ℗ Y © 2013 MUSICA & MARKETING CHILE LTDA. RESERVADOS TODOS LOS DERECHOS DEL PRODUCTOR, DE LOS AUTORES Y DE LOS INTERPRETES DE LAS OBRAS REPRODUCIDAS EN ESTE EJEMPLAR, PROHIBIDA LA REPRODUCCION, REGRABACION, ALQUILER, PRESTAMO, CANJE, EJECUCION PUBLICA RADIODIFUSION Y CUALQUIER USO NO AUTORIZADO DE ESTOS FONOGRAMAS. FABRICADO Y DISTRIBUIDO POR MUSICA & MARKETING CHILE LTDA. BAJO LICENCIA DE WARNER MUSIC CHILE S.A.". The regular "WWW.A-HA.COM" website, standard white barcode "5 050467 622524" and "WARNER STRATEGIC MARKETING" logo are again displayed, but the release now includes a "MUSICA & MARKETING CHILE S.A." logo rather than the previous "WARNER MUSIC CHILE" logo. The same European Catalogue number is used throughout. The Indian release comes with the standard artworks, but includes an "IMI" silver hologram and red and white "EMI Music India Presents" stickers on the front of the CD case, the usual "20 years of hits digitally remastered" blue sticker in the yellow text is additionally shown. The release is similar to the non-European editions except for some Indian Marketing text and additional maximum retail price coding printed on the back sleeve; "This Compilation ℗ & © 2004 Warner Strategic Marketing, a division of Warner Music international for the world outside of the US. A Warner Music Group Company. All rights reserved. Unauthorised copying, hiring, lending, public performance and broadcasting of this recording prohibited. Marketed in India under exclusive license from WEA International Inc. by Virgin Records (India) Pvt. Ltd. 203/204. ‘A’ Wing, Navbharat Estates, Zakaria Bunder Road, Sewri (W), Mumbai 15. Mtg in India by Multimedia Frontiers Ltd. C/6, GIDC, Electronics Estate, Gandhinagar – 382044, Gujarat. All rights of the works reproduced reserved. Unauthorised copying, hiring, lending, public performance and broadcasting of this record prohibited. One pre-recorded compact disc Maximum Retail Price Rs. 395/- inclusive of all taxes". The usual "WWW.A-HA.COM" website address and "WARNER STRATEGIC MARKETING" logo are displayed on the back sleeve along with the regular white barcode "5 050467 622524", but the barcode additionally including a date reference; "PKD. 08/2007" underneath. The regular album booklet is included inside. The disc is white with silver text and is similar to the non-European editions displaying the regular silver shaped square around the centre ring and triangular on the right hand side. The "A-ha" silver patterned logo is located as usual on the left. There is some Manufacturing matrix information; "MULTIMEDIA FRONTIERS LIMITED" printed around the centre ring, whilst around the outer rim of the disc is the same Marketing information which appears on the back sleeve. The Japanese CD edition of "The Singles 1984|2004" was released on 8 March 2006. It comes with an additional white obi-strip with red and black text. Part of the front artwork which the obi covers is also printed on the side of the obi strip. The Japanese Catalogue number WPCR-13038 is printed in black at the top of the obi, with a large red circle displaying the price ¥1,500 and other English and Japanese text in white; "WARNER MUSIC JAPAN 35th ANNIVERSARY SUPER FANTASTIC BEST". The centre of the front obi has a-ha in red displayed orientated with the title all in Japanese printed again in red alongside. Some other Japanese text shown instead in black referring to a-ha is included on the right. The bottom of the front obi displays the "WARNER STATEGIC MARKETING" logo in black with again the red price tag ¥1,500 and other black printed dated 06.9.7 and ¥1,429 priced information. The spine of the obi is also white with a round blue and white "SUPER FANTASTIC BEST 35" mini circle at the top, with a-ha and the album title again in Japanese printed oriented down the middle. The lower half of the spine includes a blue ¥1,500 price tag, blue "Warner Music" logo and Catalogue number WPCR 13038 at the bottom. On the reverse of the obi which is white with black text, the track listing is printed all in Japanese, the track numbers alongside are in blue. A white barcode is included at the bottom and comes with a different number "4 943674 062119" compared to the regular European barcode. Some other Japanese text is included throughout along with the release date; "06.3.8 (04.11)", "http://wmg.jp/" website address and "COMPACT disc DIGITAL AUDIO", "JASPAC" and "STEREO" logos. The album itself contains similar front and back cover artwork to the European release except for Manufacturing and Copyright information, plus catalogue number on the reverse which is displayed differently; "This Compilation ℗ & © 2004 Warner Strategic Marketing, a division of Warner Music International for the world outside of the US. A Warner Music Group Company. All rights reserved. Unauthorized duplication, public performance, broadcasting, renting, copying and making transmittable of this disc prohibited. Made in Japan. Manufactured and distributed by Warner Music Japan Inc., A Warner Music Group Company. WPCR-13038". The regular "WWW.A-HA.COM" website and "WARNER STRATEGIC MARKETING" logo are included but no barcode. The disc itself is white with silver text and is similar to the European release which displays the square and triangular shapes and A-ha made up logo in white (rather than silver) around the centre ring and on the left and right hand sides. The regular "WARNER STRATEGIC MARKETING" logo is also displayed on the right hand side, but additionally includes the "COMPACT disc DIGITAL AUDIO" and "JASPAC" logos. The Japanese Catalogue number WPCR-13038 is also present. Around the outer rim of the disc is the same Manufacturing and Copyright information which appears on the back sleeve. The inside of the album includes the European colour booklet, but comes with an additional grey and white 22-paged lyric paper booklet with all the lyrics printed in English and Japanese. Promo editions of the CD have a white promo sticker with red text over the barcode and "SAMPLE NOT FOR SALE" printed in black around the centre of the disc. There was another Japanese CD reissue of "The Singles 1984|2004" which was released on 7 April 2010. It comes instead with a white obi-strip with red, blue & black text. Again, part of the front artwork which the obi covers is also printed on the side of the obi strip. The usual large round circle at the top of the obi with the price tag ¥1,500 and "40th ANNIVERSARY WARNER SUPER BEST 40" and other Japanese text is now coloured red and blue on a white background. The Catalogue number WPCR-14025 at the top of the obi has changed compared to the earlier Japanese release and is again printed in black. The a-ha logo down the middle is shown in the usual red with the black Japanese title displayed landscaped down the left, with some other Japanese text referring to a-ha down the right. Some gold strips containing a date of "2004" and further Japanese white text is included at the lower half of the front obi, the blue "WARNER STRATEGIC MARKETING" logo, red price tag ¥1,500 and other black printed dated 10.10.6 and ¥1,429 priced information is shown at the very bottom. The obi spine comes with a similar layout to the earlier Japanese release, but includes a lighter round blue circle containing "WARNER SUPER BEST 40" in white. The a-ha logo and album title printed in Japanese is again displayed oriented down the middle, with the lower end of the spine including a red Y1,500 price tag, blue "Warner Music" logo and revised Catalogue number WPCR-14025. On the reverse of the obi which is white with black text, the track listing is again all shown all in Japanese, with the track numbers alongside this time in red. A white barcode is included at the bottom and comes with a different number "4 943674 097432" compared to the European and earlier Japanese release. Some other Japanese text has again been included throughout, along with the release date; "10.4.7 (04.11)", "http://wmg.jp/" website address and "COMPACT disc DIGITAL AUDIO", "JASPAC"" and STEREO" logos. The front & back cover artworks are again virtually the same as the previous Japanese release including the same Manufacturing and Copyright information on the back sleeve, apart from a change to the Catalogue Number which is now WPCR-14025. Also included as usual is the 22-paged grey and white paper lyric insert booklet with all the lyrics again printed in English & Japanese. The Korean release comes with the regular front and back cover artworks, but includes a large green sticker with some Korean yellow printed text on the front of the CD case. The album was made in Korea and includes some Korean Manufacturing and distributing information on the back sleeve; ""This Compilation: ℗ & © 2004 Warner Strategic Marketing, a division of Warner Music International for the world outside of the US. Manufactured & Distributed by WARNER MUSIC KOREA Ltd. A Warner Music Group Company. Registration No. 1189 to the Ministry of Culture & Tourism. Made in Korea (2004.12). All rights of the producer and of the owner of the work reproduced reserved. Unauthorized copying, hiring, lending, public performance and broadcasting of this record prohibited. www.warnermusic.co.kr. There is also some other additional text mainly printed in Korean to include some production and release dates; "2004-1219 (2004.11.23) • Made in Korea (2004.12.02)". The regular "WWW.A-HA.COM" website and "WARNER STRATEGIC MARKETING" logo are included. Some copies come with a different barcode number "8 809217 572940" on the back sleeve, compared to the usual pressings which just show the standard catalogue number barcode "5 050467 622524". The inside of the album comes with the usual colour booklet, but includes an additional black and white folded insert showing the front cover artwork picture, with the remainder being printed all in Korean to include information about A-ha, the band history and the album and single releases. The disc is white with silver text and is virtually the same as the European release which doesn’t include the silver square around the centre ring or triangle on the right hand side. The same Manufacturing and distributing text which appears on the back sleeve is printed around the outer rim of the disc. The Catalogue number is 5050467-6225-2-4. Some copies of the album which display the standard barcode number "5 050467 622524" on the back sleeve, were used for promotional purposes and include a white rectangular sticker (instead of the usual green and yellow one) with some black printed text on the front cover. The title is printed in both English and Korean, with some further Korean information regarding the album listed underneath. There is also a small white sticker stuck over the barcode on the back sleeve, which displays that the album was "NOT FOR SALE promotional use only". The Malaysian release comes with the regular front and back cover artworks. There is an additional silver "TULEN KPON & HEP ORIGINAL" hologram sticker located at the top right hand corner of the front sleeve. On the back cover, the Manufacturing and distributing information has been revised to read; "This Compilation ℗ & © 2004 Warner Strategic Marketing division of Warner Music International for the world outside of the US. A Warner Music Group Company. All rights reserved. Unauthorised copying, hiring, lending, public performance and broadcasting of this recording prohibited. Manufactured and distributed by Warner Music (Malaysia) Sdn Bhd (Co. No: 38942-P), A Warner Music Group Company. 9th Floor, MUI Plaza, Jalan P. Ramlee, 50250 Kuala Lumpur. LC 02982". The regular white barcode "5 050467 622524", "WWW.A-HA.COM" website address and "WARNER STRATEGIC MARKETING" logo are also shown. The inside of the album comes with the usual colour booklet displaying pictures of a-ha and the history of the band. The disc itself is coloured much whiter and clearer than the European edition and comes with the usual silver printed text. Like several other non-European releases, there is an additional silver square printed around the clear centre ring and a silver triangle to the right hand side of the disc. The silver shaped patterns to the left which appear to be making up the word "A-ha" are also displayed. The title "a-ha THE SINGLES 1984|2004" is included as usual at the top, with the hand drawn pictures of the three A-ha band members at the bottom. The "WARNER STRATEGIC MARKETING" logo is located as usual to the right, but unlike the European edition, the Catalogue number has been printed around the outer rim of the disc, rather than under the "WSM" logo. The same Manufacturing and distributing information which appears on the back sleeve has also been included around the outer rim of the disc. The Russian edition comes in a card slip-case with a similar front and back cover to the regular European album. On the back sleeve of both the slip-case and actual CD case, the Manufacturing and distributing information has been changed to include some contact address details and is printed mainly in Russian; "This compilation © & ℗ 2004 Warner Strategic Marketing, a division of Warner Music International for the world outside of the US. A Warner Music Group Company. © & ℗ 2004 000 "Сервис Партнер". Все права защищены. ГОСТ 27667-88, ГОСТ 28376-89, ГОСТ Р 51121-97. Дистрибьюция: "Торговая Фирма Никитин". Тел./факс: (095) 730-73-39 (-40, -41). Адрес для направления предложений и претензий: 117105, Москва, Варшавское шоссе, д. 25 а, стр. 1, к111. E-mail: [email protected]". When translated it reads; "© & ℗ 2004 000 "Service Partner". All rights reserved. GOST 27667-88, GOST 28376-89, GOST R 51121-97. Distribution: "Trading Firm Nikitin". Tel./fax: (095) 730-73-39 (-40, -41). Address for sending proposals and claims: 117105, Moscow, Varshavskoe shosse, 25a, p. 1, k111. E-mail: [email protected]". The regular "WWW.A-HA.COM" website, white barcode displaying the same European number "5 050467 622524" and "WARNER STRATEGIC MARKETING" logo are also included. 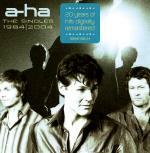 On the spine of the slip-case and CD case, the layout is again similar to the European release with the title "a-ha THE SINGLES 1984|2004" displayed in the centre. The Catalogue number on the left hand side has been amended to include an additional number at the end 5050467-6225-2-4 СП-006/04, with the usual "WARNER STRATEGIC MARKETING" logo shown on the right. The inside of the album includes an insert which instead folds out (rather than being a booklet), the regular text containing the history of the band is shown, but has been condensed and printed in a smaller font size in order to cover only two sides, rather than the usual four, there is also a collage made up of Morten's, Magne's and Paul's faces on one side only (rather than one page for each band member). The full track listing has again been condensed onto one side rather than two, with the regular back page artworks showing the backs of the three band members running outdoors. The cream box displaying the names of the three band members; "a-ha MORTEN HARKET VOCALS, MAGNE FURHOLMEN KEYBOARDS and PAUL WAAKTAAR-SAVOY GUITARS" has now been relocated to the bottom left hand corner of the back page. The Russian disc differs from the European one in that the square and triangle shapes around the centre ring and on right hand side have been printed in silver, making them stand out much more. The regular layout of the disc is otherwise the same apart from the revised Catalogue number 5050467-6225-2-4 СП-006/04 on the right hand side, next to the usual "WARNER STATEGIC MARKETING" logo, and the additional Russian text which is included around the outer rim; "Произведено 000 "Руссобит-Софт" 127106 г. Москва, Алтуфьевское шоссе. д. 5, т.401-88-55 ГОСТ 27667-88, ГОСТ 28376-89. This compilation © & ℗ 2004 Warner Strategic Marketing, a division of Warner Music International for the world outside of the US. A Warner Music Group Company. © & ℗ 2004 000 "Сервис Партнер" Все права защищены. Unauthorised copying, hiring, lending, public performance and broadcasting of this recording prohibited". There was also a Russian "НИКИТИН" re-issue which comes in a jewel case with an obi strip rather than a slip-case. The Catalogue number 4607173157812 on display differs somewhat compared to that one used on the earlier Russian release. The cover is of similar design to the European release and the earlier Russian edition, but includes an additional silver "WARNER MUSIC INTERNATIONAL FOR SALE IN RUSSIA" hologram sticker in the top right hand corner. The obi-strip has a mirror image of the picture of Paul from the front sleeve printed on the front. The "WARNER MUSIC" logo is displayed at the top in white, with a cream rectangle with a red border underneath containing some Russian text; "ВКЛЮЧАЕТ ХИТЫ:" (INCLUDES HITS:) printed in black with the hit singles; "«TAKE ON ME» «SUMMER MOVED ON» «THE SUN ALWAYS SHINES ON TV» N «FOREVER NOT YOURS»" in red. There is some further red and white Russian text displaying some A-ha credits and statistics which are printed at the lower half of the front obi; "«НОРВЕЖСКАЯ ГРУППА A-HA НИКОГДА НЕ СХОДИЛА С МУЗЫКАЛЬНОГО ОЛИМПА, И ДАННЫЙ СБОРНИК ЛУЧШИХ ХИТОВ ГРУППЫ - ЛОГИЧЕСКОЕ ПРОДОЛЖЕНИЕ ИХ 20-ЛЕТНЕЙ КАРЬЕРЫ», (ALLMUSIC) A-HA - ОДИН ИЗ ВЕДУЩИХ КОЛЛЕКТИВОВ СТИЛЯ ЗЛЕКТРО-ПОП. ПЕСНИ ГРУППЫ A-HA 63 РАЗА ЗАНИМАЛИ ПЕРВЫЕ МЕСТА В ХИТ-ПАРАДАХ 27 СТРАН МИРА, А ОБЩЕЕ КОЛИЧЕСТВО ПРОДАННЫХ АЛЬБОМОВ ДОСТИГАЕТ 30 МЛН. КОПИЙ". When translated it reads; "NORWEGIAN A-HA GROUP NEVER AGAINST THE MUSICAL OLYMP, AND THIS COLLECTION OF THE BEST HITS OF THE GROUP - THE LOGIC CONTINUATION OF THEIR 20-YEAR CAREER, (ALLMUSIC) A-HA IS ONE OF THE LEADING STAKES OF THE STYLE OF ELEKTRO-POP. SONGS OF THE GROUP A-HA 63 TIMES ATTENTION THE FIRST PLACES IN THE HIT PARADAS OF 27 COUNTRIES OF THE WORLD, AND THE TOTAL NUMBER OF SOLD ALBUMS REACHES 30 MILLION COPIES". At the very bottom, there is a picture of the Russian flag and the fact that the CD was "FOR SALE IN RUSSIA", it also displays that the CD was released by ФИРМА ГРАМЗАПИСИ НИКТИН (Record Company НИКТИН). The obi spine and side of the CD case comes with a similar layout to the European release which displays the regular title "a-ha THE SINGLES 1984|2004" in the centre, with "ФИРМА ГРАМЗАПИСИ НИКТИН" again shown on the left hand side (with the "WARNER STRATEGIC MARKETING" logo included alongside, but present only on the CD case spine). The Catalogue number 4607173157812 is printed on the right hand side on both slip-case and CD case. The reverse of the obi-strip has part of the back sleeve image on it which again matches up with the CD back sleeve. There is some Russian black text; "Также в продаже:" (Also on sale:) at the top, plus a-ha in yellow with shots of the available albums "EAST OF THE SUN WEST OF THE MOON 4670001545389" and "HUNTING HIGH AND LOW 4607173154965" whilst at the bottom, the "ФИРМА ГРАМЗАПИСИ НИКИТИН" logo in the shape of a shield, white barcode "4607173 157812" and "www.fgnikitin.ru" website address are shown. On the back sleeve, the regular English Production and Copyright information is included underneath the track listing; "This Compilation ℗ & © 2004 Warner Strategic Marketing, a division of Warner Music International for the world outside of the US. A Warner Music Group Company. A Warner Music Group Company. All rights reserved. Unauthorised copying, hiring, lending, public performance and broadcasting of this recording prohibited." which is similar to that shown on the earlier Russian slip-case edition; but some other additional Production and Russian "НИКИТИН" Record Company contact details, plus "Do not expose to mechanical or magnetic influences. Avoid direct sunlight and moisture" information is included on the left hand side and displayed landscaped; "Произведено в России. Издателы: ООО «Фирма грамзаписи «Никитин» по зксклюзивной лицензии «Warner Music». Все права защищены. Адрес для направления предложений и претензий - «Фирма грамзаписи «Никитин», 105082, г.Москва, ул.М.Почтовая Д. 12, стр. 1, тел./факс:(495) 232-13-87; e-mail: [email protected], www.fgnikitin.ru Зксклюзивный дистрибьютор - «Торговая фирма «Никитин»: тел. : (499) 265-49-07, 265-49-18; e-mail: [email protected], www.tfnretail.ru. Изготовитель (см. информацию на внутреннем кольце компакт-диска вокруг установочного отверстия): ООО «Уральский злектронный завод», 620137, г.Екатеринбург, ул.Студенческая, д.9, корп. 11а.Лицензия ВАФ № 77-15 от 21.09.07 г. ООО «Линос» 117587, г.Москва Варшавское шоссе, д.125ж стр 1. Лицензия ВАФ № 77-238 от 03.02.2006г. Музыкальный компакт-диск формата CD-DA. ГОСТ 27667-88, ГОСТ 28376-89, ГОСТ Р 51121-97. Содержит музыкальную запись. Не подлежит обязательной сертификации. Не подвергать механическому или магнитному воздействию. Избегать попадания прямых солнечных лучей и влаги". The back sleeve also includes "ФИРМА ГРАМЗАПИСИ НИКИТИН", "WARNER STAREGIC MARKETING" and "COMPACT disc DIGITAL" logos and the same white barcode which appears on the obi-strip. 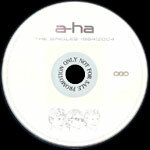 The disc itself is plain white with silver printed text and is similar to the European release displaying the title "a-ha THE SINGLES 1984|2004" at the top, with the hand-drawn pictures of the three band members along the bottom. There appears to be no additional square or triangular shapes included, nor the usual A-ha shaped logo on the left hand side. The "WARNER STRATEGIC MARKETING" logo and "ФИРМА ГРАМЗАПИСИ НИКИТИН" is displayed on the right in addition to the Catalogue number 4607173157812. Around the outer edge of the disc is some Russian and English Production and Copyright text which is similar to that printed on the back sleeve. The inside of the album includes the regular 22-page colour booklet, rather than the fold-out insert which appeared on the earlier Russian slipcase edition. "The Singles 1984|2004" Singapore release comes with similar artwork to the European release, but includes some revised Marketing, manufacturing & distributing information printed on the back sleeve; "This Compilation ℗ & © 2004 Warner Strategic Marketing, a division of Warner Music International for the world outside of the US. A Warner Music Group Company. All rights reserved. Unauthorised copying, hiring, lending, public performance and broadcasting of this recording prohibited. Marketed, Manufactured and Distributed by Warner Music Singapore Pte Ltd.". The Singapore "Warnermusic.com.sg" website address is also included along with the regular "WWW.A-HA.COM" website and "WARNER STRATEGIC MARKETING" logo. The white barcode is also present and displays the same number "5 050467 622524" as the European edition. On the front cover, we have the usual blue sticker which reads "20 years of hits digitally remastered". There is also a small square blue & silver "WARNER MUSIC 0688894" hologram sticker. The inside of the album contains the standard European colour booklet. The actual disc itself is similar to the non-European releases, white with silver printed text, displaying the large silver square and triangular shapes with the A-ha logoed pattern on the left hand side. The centre ring is also silver rather than white and is somewhat larger than the standard non-European releases. The same Marketing, manufacturing and distributing information which appears on the back sleeve is also shown around the outer rim of the disc. The album comes with the standard Catalogue number 50 5046 76225-2 4 but is set out slightly differently. "The Singles 1984|2004" album was also released in South Africa. The front and back cover artwork is virtually the same as the European edition, but the album was released instead by "Gallo Record Company" and made by "CDT". On the back sleeve and around the outer rim of the disc there is some Marketing and Distributing information which has been amended to read; "This Compilation ℗ & © 2004 Warner Strategic Marketing, a division of Warner Music International for the world outside of the US. A Warner Music Group Company. Marketed and Distributed by Gallo Record Company. All rights reserved. Unauthorised, hiring, lending, public performance and broadcasting of this recording prohibited. CDESP 194". The regular "WWW.A-HA.COM" website is also shown on the back sleeve along with the "WARNER STRATEGIC MARKETING" and additional "Gallo Record Company" logos. The white barcode on display comes with a different number "6 001212 094836" compared to the European edition. The album also includes the regular colour booklet, but displays the revised Catalogue number on the back page. The actual layout of the disc itself is similar to the non-European editions which include the silver square printed around the centre ring of the disc and silver triangle on the right hand side. The shapes on the left hand side making up the "a-ha" logo are also shown. The disc also includes the South African "Gallo" and "RiSA" logos along with the regular "WARNER STRATEGIC MARKETING" logo and revised Catalogue number CDESP 194. Take On Me / Hunting High And Low / The Sun Always Shines On TV / Summer Moved On / Minor Earth Major Sky / Forever Not Yours. 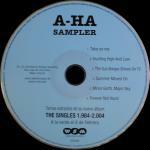 The disc is light blue with "A-HA Sampler" printed in black at the top. The track list is printed on the right hand side and the copyright information on the left. At the bottom of the disc, the following text is printed "Termas extraidos de su nevo album The Singles 1.984-2.004 A la venta el 8 de Febrero". The regular European CD release appears to have been used for the Taiwan edition, but comes with an additional green and blue Taiwan obi strip covering the whole of the back sleeve. The regular artwork picture containing a silhouetted shot of the band is displayed along the top of the obi back sleeve, but has been covered up slightly with an additional pale green banner showing the full track listings in black running from left to right. The lower half of the back obi displays a large amount of Taiwanese text in white regarding the three band members Paul, Magne and Morten of A-ha, and the history of the band, it also makes reference to Morten’s previous band Souldier Blue and Steve Barron’s Take On Me video being broadcasted on MTV. The catalogue of hit singles and albums including year of release and UK/US singles chart positions are also shown. Along the bottom of the back obi is a smaller white barcode compared to the European release, although it contains the same number "5 050467 622524". The regular white "WARNER STRATEGIC MARKETING" logo and additional blue and white "WARNER MUSIC TAIWAN" logo are included. Some Taiwan Record Company contact details are printed in white to include a telephone number 02-27881598 and the "Warnermusic.com.tw" website address. The front of the obi strip has a-ha in white with the title printed in black and white Taiwanese text. There is a cream rectangle at the bottom with some other greenish Taiwanese text making reference to some of A-ha’s hit singles; "Take On Me", "The Sun Always Shines On TV", "Stay On These Roads", "Crying In The Rain", "The Living Daylights" and "Summer Moved On" included on the album. The obi spine displays a mixture of pale green, white and cream colours to make up the title "a-ha THE SINGLES 1984|2004" displayed this time in both English and Taiwanese, the blue and white "WARNER MUSIC TAIWAN" logo is located at the top and Catalogue number at the bottom 5050467622524. Sealed copies of the album additionally include a "WARNER MUSIC Taiwan" seal wrapped around the whole of the CD case. The Thailand release of the album is almost identical to the European release but comes without the "20 years of hits digitally remastered 5050467-6225-2-4" sticker on the front cover. On the back sleeve, the Manufactured and distributed information has been amended to show that the album was made in Thailand rather than the EU, it displays; "This Compilation ℗ & © 2004 Warner Strategic Marketing, a division at Warner Music International for the world outside of the US. A Warner Music Group Company. All rights reserved. Unauthorised copying, hiring, lending, public performance and broadcasting of this recording prohibited. Manufactured and Distributed by Warner music Thailand". Like the European release, the disc is white with silver printed text and does not include the additional silver square or triangular shapes around the centre ring or on the right hand side. The shapes making up the "a-ha" logo on the left hand side are also virtually none existent. The same Manufacturing and distributing text which appears on the back sleeve is also printed around the outer rim of the disc. The regular colour booklet is also included, displaying the Catalogue number 5050467-6225-2-4 on the reverse. The promo edition comes with a hole punched in the barcode on the back sleeve and the text "PROMOTION ONLY NOT FOR SALE" is printed in white around the centre ring of the disc. The Ukraine CD release is by Odyssey. The artwork on the front and back sleeve is similar to the European release, but there is no "20 years of hits digitally remastered" sticker included on the front sleeve, it comes instead with two small double sized blue and yellow rectangles located in the bottom right hand corner, with the Ukrainian text "зроблено в украiнi" which translates to "MADE IN UKRAINE". On the back sleeve, there is some further additional Production and Copyright Ukrainian black printed text displayed along the top; "℗ 2008 Компания Одиссей / Планета Хитов по зксклюзивной лицензии Warner Music Austria. Все права защищеньі. Незаконное копирование, тиражирование, сдача в прокат и любое публичное использование запрещено и преследуется законом об авторских правах. По вопросам лицензирования обращаться e-mail: [email protected] Эксклюзивные права на распространение принадлежат компании «Одиссей»: 65012, г. Одесса, ул. Осипова, 48, тел. : +38(050) 336-73-73. A-HA / The Singles 1984-2004, 1 аудио-сd. Качество гарантировано, 6 месяцев от датьі приобретения. Хранить при t: -10°/+30°C. Не подежит обязательной сертификации. Подробная информация на сайтвх: www.odyssey.od.ua и www.planetahitov.com" which translates to; "℗ 2008 The Odyssey / Planet Hits Company under the exclusive license of Warner Music Austria. All rights reserved. Illegal copying, copying, rental, and any public use is prohibited and enforced by copyright law. For licensing please contact e-mail: [email protected] Exclusive rights to distribution belong to Odyssey Company: 65012, Odessa, ul. Osipova, 48, tel . : +38 (050) 336-73-73. A-HA / The Singles 1984-2004, 1 audio-CD. Quality is guaranteed, 6 months from giving and purchasing. Store at t: -10°/+30°C. No mandatory certification. More information on the site: www.odyssey.od.ua and www.planetahitov.com and includes a globe "PLANET OF HITS" and "Odyssey" snake logos in the top left hand corner. A silver hologram sticker with the text; "A-HA THE SINGLES: 1984-2004" in black, plus "КОНТРОЛЬНА МАРКА" (CONTROL MARK) in silver is displayed on the lower right hand side. The Manufacturing and Copyright information on the back sleeve is however exactly the same as the European release; "This Compilation ℗ & © 2004 Warner Strategic Marketing, a division of Warner Music International for the world outside of the US. A Warner Music Group Company. All rights reserved. Unauthorised copying, hiring, lending, public performance and broadcasting of this recording prohibited. Manufactured in the E.U. LC02982". The regular "WWW.A-HA.COM" website and "WARNER STRATEGIC MARKETING" logo are also shown, but the usual white barcode comes instead with a different number "4 823022 800016". The layout of the spine is similar to the European release with the title "a-ha THE SINGLES 1984|2004" displayed in the centre. The "Odyssey" logo and Ukrainian Catalogue number OD000777 are shown on the left, with the regular European Catalogue number 5050467-6225-2-4 and "WARNER STRATEGIC MARKETING" logo on the right. The layout of the disc is based on the non-European releases which includes the additional silver square around the centre ring of the disc and other shapes making up a triangle on the right and a-ha logo on the left. The usual "WARNER STRATEGIC MARKETING" logo is also included on the right hand side, but doesn’t include any of the Catalogue numbers. Around the outer rim of the disc is the same European made Manufacturing and Copyright information and additional Ukrainian Production and Copyright text which appears on the back sleeve. The usual colour booklet is also included with the album. On 4 May 2010, a-ha released "The Singles 1984|2004" collection in the U.S. on Rhino Records. The front and back cover artwork is similar to the European release but the Manufacturing, marketing and copyright text on the back sleeve is slightly different; "This Compilation ℗ & © 2004 Rhino Entertainment Company, a Warner Music Group Company, for the U.S. and WEA International Inc. for the world outside of the U.S. All rights reserved. Manufactured and Marketed by Rhino Entertainment Company, 3400 W. Olive Ave., Burbank, CA 91505-4614. Printed in the U.S.A. FBI Anti-Piracy Warning: Unauthorized copying is punishable under federal law". The layout of the barcode on the back sleeve is also slightly smaller and contains a different number "0 8122 79802 14" compared to the European edition. The regular "WWW.A-HA.COM" website is included along with some additional "RHINO", "WB RECORDS" and "FBI ANTI-PIRACY WARNING" logos. On the front sleeve, it comes with a blue sticker similar to the European editions but with different wording which reads "Features the Classic Take On Me" in yellow plus the Catalogue number R2 524528 underneath. 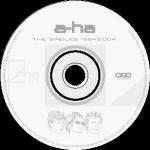 The top of the CD case comes with a long white pull seal with black and blue text, the Catalogue number R2 524528 is displayed on the left, with the title "A-HA The Singles 1984 – 2004" in the middle and a white barcode without any numbers on the right. The disc features the same layout as the non-European releases which includes the additional silver square (rather than white) printed around the centre ring of the disc, and other triangular shapes and A-ha logoed design on the left and right hand sides are shown. Some of the Manufacturing, marketing and copyright information which appears on the black sleeve is additionally displayed around the outer rim of the disc. The "RHINO" and "WB RECORDS" logos, plus Catalogue number R2 524528 are also included to the right of the disc. Hungary The Singles 1984|2004 5050467-6225-2-4?